1. Please affix Passport size Colour Photograph – same as that was attached in your application form – in the space provided on the upper portion of the Admit Card. 2. The Admit Card is to be submitted for verification at the time of the test. At least one original (not photocopied or scanned) and valid (not expired) photo identification card (such as College ID, Employer ID, Driving License, Passport, PAN Card, Voter ID, Aadhaar, UID) should also be presented. 3. 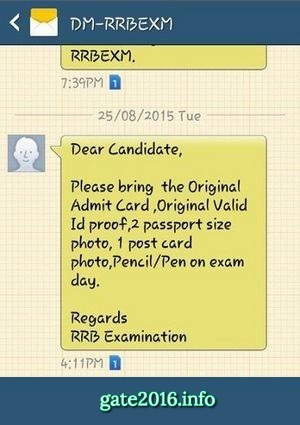 Candidates must also bring two colour photographs (of size 3.5 cm x 3.5 cm) and also a post card size photograph with clear front view of the candidate without cap and sunglasses, for appearing in the ONLINE examination. Photo graph pattern would be same in both cases as shown below. 4. This Admit Card is valid only for the test date and session time as specified above. 1. Candidates should report at 7:30 A.M. for Shift 1 ,11.30 A.M. for Shift 2 & 3.30 P.M. for Shift 3. 2. No candidate will be allowed inside the test centre after 8:00 A.M. for Shift 1, 12.00 P.M. for shift 2, 4.00 P.M. for Shift 3. 3. Mobile phones or any other electronic gadgets such as watches, calculators are NOT ALLOWED inside the Test Centre. There is no facility for safe keeping of your personal belongings outside the examination hall and RRB/Assessment service provider are not responsible for its loss. Only Admit Card, Photo ID card, pen/ pencil will be allowed inside the test hall. 4. Friends and relatives accompanying the candidate will not be allowed inside the test centre. 5. Candidates are advised to locate their test centre and its accessibility at least a day before the test so that they can reach the centre on time on the day of the test. 6. Candidate needs to make his/her own travel and stay arrangements for attending the test. 7. Change of date/centre of examination is not permitted under any circumstances. 8. Mere issue of Admit Card does not confer any right to be eligible for the post. 1. A candidate should write the Self-Declaration inside the exam lab in the presence of the Invigilator. 2. The candidate can view and answer questions in any of the 15 languages applicable. 3. There will be negative mark for wrong answers. For every wrong answer 1/3rd mark will be deducted. Use this link to familiarize yourself on how to view/answer questions on the exam day. 5. Rough sheet(s) will be provided to the candidate for rough work which will have to be returned after the test. 6. Candidate should write his/her name and registration number on the rough sheet(s). 7. The Admit Card is provisional, subject to the condition that the candidate has fulfilled the eligibility conditions like academic qualification, category, PWD status etc. as mentioned in his/her application which is subject to verification in the consecutive stages of the selection process. 8. Special instructions if any given by the Invigilator should be followed strictly. 1. The candidature is purely provisional and is liable to be cancelled at any stage of recruitment or thereafter, in case any inconsistency is noticed. 2. RRB reserves the right to order re-examination for any or all candidates. 3. Decision of the RRB in all matters will be final and binding on the candidates. I don’t have the same photograph that was used at the time of registration, can I affix another photograph on my Admit Card ??? i didn’t take reprint of application form during registration ..what should i do if i clear the exam? will there be any chance to take reprint of my application ..?kindly help me with your answer…. I don’t have print / copy of the template, please tell whether it is really required? Many exam sessions are completed till today and therefore I believe you will certainly have any information about it. As per our information they are not checking template but you must carry filled template with you. May instructor at your center check template. it is being said that tomorrow is a bandh. so is railways sse exam on 2nd sept 2015 postponed? please do reply sir. Sir is there any exam postpone for 2nd september 2015 strike in bangalore. do I have to take the printout of admit card B/W or colour, and also should I take the filled in template for the exam or not. will the exam really takes place on that strike day of 2nd september,, sir please don’t reply a pasted copy as above ,,,,,, please reply an updated information ,,,because my examination centre is about 500km far from my home . We don’t have direct contact with any RRB. If you need exact information please contact RRBs only. All are saying strike is there on 2nd September. My exam is also on same day. Is there any possibility of exam postpone. If strike will really takes place then no one will be able to attend exam but you must try to reach at exam center. What if all educational institutes are open on the day of strike. sir, My exam’s on the 2nd, and there is a buzz that, its All India Strike on that particular day. I reside in Kolkata. The exam center is at Siliguri and i am really going there. Now for guys like me.. please could you share some light on this particular matter. Should I go? Will the exam be cancelled? (It will depend on that day I know but still you must be having some insights) If it gets cancelled, when will I be informed about it? sir, i have my rrb sr engg examination on 2nd sep.. and currently iam working in cruice, and iam offshore by this 15th.. and i can come back only aftr 6 months.so mostly how long they ll take to publish the xam result.. nd is that compulsry that i should attend on the same day for certificate varification. if i would selctd in the exam.?? This time RRB is conducting online exam. So there is a good possibility that RRB will publish results soon. Most probably they will not give you any kind of relaxation at any stage of selection. I am priya.should I have to give the same photos for the passport size and post size?self attested sign means should I sign or I have to get a sign from an gazetted officer? Pass port size photo should be the same as you uploaded at the time of online application form filling. Post card size photo may be same or different from passport size photo but it must not so old otherwise there may be difference in between your these two photograph. 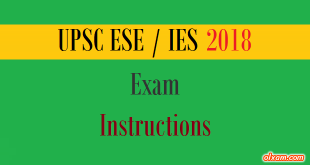 My SSE exam is on 2nd September at Kolkata. But there is All India Strike on that day. Will exam be rescheduled? Its depends upon RRB. If they will cancel exam they will either email you or message you about cancellation of exam. Hai sir, in JE exam post card size photo means stamp size is correct or not. Please read below post everything is mentioned there clearly. sir actuly when i feel the form of railways exm i provide 1 photo nw after get halltikit i dnt have photo which is on hall ticket then i m confused nw wat i do plz guide me i m living at kalyan and my exm centre on nashik sangmaner …..
You must visit the photograph shop from where you get clicked that photograph and tell them about your issue they will check your photograph in their record if they found one they will given you a copy of that otherwise try to find same one somewhere in your any form you filled earlier or dress up like the same as in that photograph and again get clicked the photo, which would look like the same that may work either if nothing works. This is what we can do for you right now. hi sir.. can u please tell me regarding postcard size photo.. whether it is same in photo as in admit card or recent photo of mine..
plz tel lme sir right now! Don’t worry about shifts it is the matter of RRB you just remember your exam day and time. i have not received any message from rrb for admit card . wat to do now?? (1) Download your admit card, if you haven’t download yet. 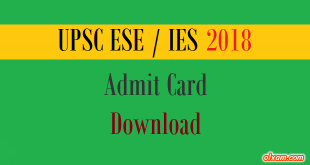 (2) If you are able to download admit card then download it and check your exam center. (3) Wait till RRB exam date if you get a message from RRB then check your RRB exam admit card status again on RRB website. If it is different then previous one then the new details are valid for you if the details are same then no need to worry. (4) If you dont get any message from RRB till your exam date then atleast once again check your admit card status before going to attend exam. Sir, tomorrow is my JE exam i don’t have postcard photo. So I am eligible or not for the exam. As per RRB instruction you must have a post card size photo. Please follow below link for RRB SSE/JE paper without solution all sets. For solved paper you need to buy a book of RRB solved papers. Both kind of admit card are being accepted by exam centers. sir, should the post card size photo be same as the one that we uploaded in the application? 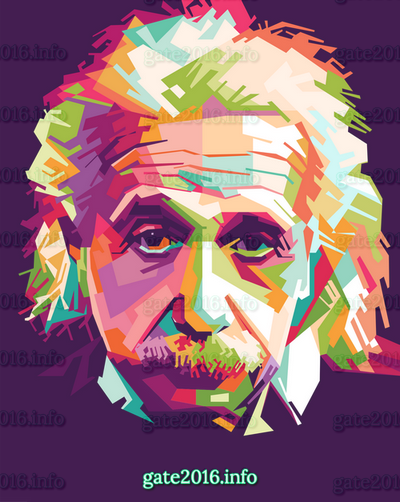 In instructions, its given for the photo to be affixed be same as that of we uploaded. Is this applies to post card size photo also?? This kind of issue is totally depends upon RRB which against you apply. Sir, i have applaid for rrb sr. engg post. i did complted my be(mech engg) course last year. but still i have one back log. if i clear the exam.. did iam eligible for that post..? As per RRB instruction a candidate must completed his/her educational qualification before filling form. Sir original admit card means …1)i am download the admit card for site and scanned black white .can this is original admit card? You will only be allowed to attend exam in the session / time mentioned in your admit card. Post card size photograph is necessary as per railways instruction. If details provided by any candidate in the online application form alter at the time of document verification. There is a good chance of being disqualified for selection. I have doubt.. Is I need to take a photograph of full front view of my body or front view of my face alone? Please clarify.. I already hav passport size photo in post card size.. But I need to clarify that full front view or face alone.. Yes postcard size photo should be enlarged form of passport size photo. of the admit card and post size is my full photo or only a FACE ? admin plz help i m zeenat..which one i ws upload in frm tht pic is not now wid me..if i affix new passportsize pic thn its ok or not? hii sir, i have downloaded rrb examination hallticket for sr.engg, but i havnt received any message regarding to download hallticket. is my hallticket is valid?? and noticed that there is a call for bharth bandh on sep 2nd. and my examination date is also on sep 2nd… if bharathbandh took place, did the examination will get postponded..?? No need to worry about message. If you get your admit card then its fine. If you want to be more precise then once check again your admit card details few days before your exam date for conformation. If bharath bandh really takes place then no one will be able to attend exam but you must try to reach at exam center. What if all educational institutes are open on the day of bharath bandh. calci is allowed or not allowed. Calculator is not allowed in RRB SSE/JE Exam. No educational certificate would be required at the day of Exam. Do not try to enlarge it. Go to photo studio and get clicked a new photo of size post card. Whatever you are doing can also be reason of your rejection at exam center. Don’t worry about your session. There is time mentioned on your admit card. Schedule yourself as per that. can you tell me about the community under UR. sir my name is ANKUR and by mistake on application form I have written my name ANKU will I be allowed to give exam or not bcoz in my id my name is ankur. Most probably they will not allow you. If any how you enter in the exam hall and get selected you will be out at the time of document verification. can u tell me,what is post card size photograph. The information you need is provided in the above post very well. Please check it once completely. Is post card is mandatory? Plz provide the answer of JE & sse questions paper upload by you …. post card size photo means what.? and predefined template is to bring along to the centre? We have updated post with the information which you want. Please check post again. Is predefined template is needed at the exam centre.